The procedure to place an implant takes 30 to 60 minutes for one implant and only 2 to 3 hours for multiple implants. The number of appointments and time required, vary from patient to patient. Prior to surgery, you will receive antibiotics and anti-bacterial mouthrinses. For greater comfort, you can have the procedure done with nitrous oxide (laughing gas) or intravenous sedation. These options are discussed with you at your consultation appointment. Local Anesthesia is used to numb the area. When you are comfortable, a small incision is made in the gum tissue to reveal the bone, space is created using special instruments, and an implant is gently inserted. The top of this implant is often visible through the gum. Sometimes it is better in the early stages of healing to have the implant covered by the gum tissue. Now the healing begins. The length of time varies from person to person, depending upon the quality and quantity of bone. The usual waiting period is 2-4 months. After the initial phase of healing, the surgeon places an abutment (support post) or a healing cap onto the implant during a brief follow-up visit. This allows gum tissue to mature and provides access to the implant. If your tooth has been missing for some time, the adjacent support bone is likely to grow thinner and shrink. This occurs because the root of the natural tooth has to be present to stimulate the bone. 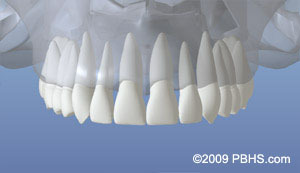 As much as 25% of the width of bone can be lost in the first year following tooth extraction. 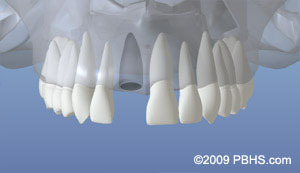 If you are missing enough bone, you may need additional bone graft to that area prior to implant placement.